Letting the invisibility vanish, Siréne joined the others as one and all made way to Ara-Kari. It seemed as likely a path as any in this unknown world. It was a boat they needed, and a city of pirates would surely have those to spare. Her instinct was to follow pathways of magic, but without any knowledge of what they faced, a traveling spell could cost them dearly. Caution held her hand. As they walked along, thoughts of Ara-Kari and its dark history floated through her mind. This place was dying, and it could claim them as easily as any other threat. "We must tread softly in this," Siréne spoke letting urgency carry her voice. "I may not be able to remember every detail of this city, but Ara-Kari has a dark history. Of that I am certain. Whether it is ruled by demons or men has been lost in the sea of time, but it is a dark place and it is destined to die. We must not be caught in its death throes." Pausing, the enchantress looked to her companions. "Moreover, It was spoken that we are walking into a city of thieves covered in wealth. Simple logic would tell us to disguise this. I have magics that can deceive and hide. Should we enter this city, it would be wise to walk under a veil of magic." Posted on 2015-11-15 at 13:28:25. "You are right lass, we might just stand out a bit in the city. Powerful as we are, there is danger for us. I'd as soon scout the edge of the city first and see if we can borrow a wee fishing boat before entering the city itself. If we do enter the city your magic disguise will be most helpful." Posted on 2015-11-15 at 20:53:53. With the party semi-agreed to head towards the city, they quickly moved following the two wagons and their escorts to its outskirts. Branching off the road a half-mile before a single sturdy bridge leading into the city, they moved into the small hills located to their left. With Rayne and Roan leading the party sought a good place to view as much of the city as possible without being seen. Easily finding such a spot the party began its observation of the city. From what they could see of its outskirts and interior streets the city was quite populated by many different races from Dwarf’s to Humans to more Giants to name the most prominent. However to their surprise they could also see that a number of Orc’s, Goblins, and Kobolds also roamed the city streets. Continuing to watch they also became aware after a few moments that a number of crossbreds from the various races including Half-Orcs, Half-Dwarves and even what appeared to be mutations of each race called this city home. Yet it was Roan who noticed that of the many races seen within the city, there was not a single Elf, Half-Elf or anything thing resembling an Elf. Whispering to the rest of the party he told them his observation. With each member looking closer, even more disturbing was what appeared to be a number of patrols pairing a Dwarf or Giant with a strange dog like creature the size of a dire wolf. They could easily see that the dogs were both part flesh and part blue metal, the same shade and look as those of the wagon pulling golems. Again this creature was nothing any of the party knew from their place in the future. With this single bridge being the only non-magical entrance to this port and its wharves, the question was now how to infiltrate the city of Ara-Kari without detection. Posted on 2015-11-16 at 00:04:27. Cor looked at the city and its strange hodge-podge of inhabitants. It was clear that the party would stand out and make sneaking into the city difficult. With the docks being located on the other side of the city there was no good way to reach them without entering the city. "Perhaps we should scout the castle dock before we make a final choice." It was not really a question and Cor began to walk towards the castle, hoping to find a vantage point from which to survey the land. Posted on 2015-11-21 at 10:04:41. Trust a Dwarf . . .
. . . to just take off without a discussion. "Lets go look at the castle," he said. And off Cor went to look at the castle. Such was the way of things when one dealt with Dwarves. And wizards, elves and halflings all had their own little quirks as well. Luckily human warriors weren't prone to such goofy class or racial traits. They were flexible and could go with the flow. So Lothor just said, "lead on master dwarf" and moved to follow at the back of the pack again. He kept himself busy by constantly watching their surroundings for signs of, well, anything. Scouting the castle seemed like a good idea anyway. He didn't relish a walk through that city. Posted on 2015-11-21 at 10:34:53. The rangers had done a fine job in find the party a good observations spot to gain some information on the city. The population was much more diverse than they would have expected. Having seen Dwarvs and Giants together with wagons it wasn’t surprising to see more in the city. This pairing of Giant and Dwarv appears to be the main security of this island, but these in the city also had a guard dog. The animal appeared to be a construct, part animal part golem. Who knows what type of enhanced senses this animal may have. The party may have great difficulty blending in and staying unnoticed. As they continued watch other odd sighting added to the mystery. Crossbreds of Half-Orc and Half-Dwarv casually walked the streets. To that they saw among the Humans were Orcs, Goblins and Kobolds. The reaction of the street people to the security patrols showed that this force must be very effective. Of all, what wasn’t seen was quite curious, no Elves or Half-Elves. Sirene and Alyia will be obvious walking the streets. There may be a reason for no Elvenkind and it may not be good for them. He party needs to consider all their option. As if Cor had read his thoughts he heard the Dwarv say, Perhaps we should scout the castle dock before we make a final choice." It was not really a question and Cor began to walk towards the castle, hoping to find a vantage point from which to survey the land. Posted on 2015-11-21 at 20:27:37. "Nae worry. Once we have checked both the city and the castle we will talk about what our options are. A boat is our biggest need. We night be able ta slip one or two of us in and find a ship. If we get our wizards aboard they could teleport back ta the group and then take us ta the ship. Pretty sure we could overpower most sailing crews." Posted on 2015-11-21 at 21:14:51. The party headed towards the city; though, they decided against going directly into the city. Instead, they moved off the road towards two small hills. It would give them vantage inside an unfamiliar city, without exposing themselves. Laying prone on the ground to minimize her profile, Rayne examined the city. Not only were their humans, dwarves, and giants, there was also kobolds, goblins and orcs. As surprising as that was, everyone seemed to be getting along decently. Though Rayne looked specifically for elves, not one could be found. Instead, the patrols around the city consisted of a dwarf, a giant, and some sort of mithral-enhanced hound. Were their other more sentient creatures who were similar? This city was getting stranger the more they investigated it. Not only had it not been taken over, it also had a large amount of seemingly evil species, and now Mithral being grafted with animals. Maybe this city was aligned in some way with Karza's army? The party decided to head out and explore the castle. It seems they all had similar feelings on this matter, since they decided to head over to the castle. Pushing her way down the hill a bit, to help minimize the chances of a sentry noticing her, Rayne moved back to the lead of the party. As they headed towards the castle, Rayne said, "If we do go through the town, maybe Lothor, Roan, and Cor should go in without the rest of us? Though I have faith in Sirene's spells to disguise us, Ara-Kari might have some means to see past the spell. The three of you at least sort of fit to the city, and would probably draw less attention than the rest of us." Posted on 2015-11-22 at 11:50:53. "Pretty sure we could overpower most sailing crews." Lothor glanced at their short leader. Stealing? Well, perhaps it wasn't stealing if you were just borrowing a boat from pirates. But who would they be acquiring the boat from? Lothor didn't really like it when others had legitimate reasons to question his actions. His initial thought had been hiring or buying a boat. Not stealing. But deep down he had always know that a little deftness might be needed in this act. Perhaps he could leave a little money behind on the dock. Posted on 2015-11-22 at 12:35:26. Roan had made up his own mind that the City was not the place to go, especially since there was no evidence of Elves in the area and he did not want to separate himself from Rayne. Instead, the Ranger/Cleric methodically made his way towards the bridge to cross over to the Castle side of the water, in hopes of locating a suitable boat at the dock. His preference would be to pay for or hire the boat, but his combat experience alerted him to the possibility that they may have to 'borrow' a vessel if there were no other course of action. He even considered the possibility that the owner of the Castle might have need of hiring the Party to run an 'errand' to the Isle of their quest, but he would cross that bridge when he came to it. Posted on 2015-11-22 at 14:45:51. Siréne sought though the passing crowds and found not a single elf. There was not even a single one among them with a trace of faery blood. That lack was palpable. There were few places on this earth that could bar the faery folk so completely. It unnerved her to think on what dark power could accomplish such a feat. Moving close to Rayne, she spoke with purpose,"I fear we are not safe here and, as you say, magic might not conceal us. If we can find a way to the island without entering the city, I say we take it." With that, Siréne found herself walking alongside the dwarf as they made their way to the docks. If the Goddess was with them, they would find what they need. Posted on 2015-11-22 at 17:27:21. As Cor walked, he remembered the potions in his pack. "We have the flying potions. Perhaps we dunna need a boat. There might not be enough potions for all of us to fly over but if Sirene and Ulthok go they could then return and teleport us all over. Even if it took a day or two to memorize the proper spells it might be safer than trying to get a boat." Posted on 2015-11-22 at 20:41:15. Fly like an Eagle or Swim like a fish. Having watched the activity in the small city of Ara-Kari for the better part of an hour. The party found that with its vigilant patrols, its numbers of normally hostile races and most disturbing, its complete lack of Elves. That checking out the castle and the dock beyond it to the North seemed a safer proposition. Moving to the East once more they retraced their steps following the road. In a short amount of the time the road turned to the South then once more to the East, this part of the road not yet traveled by the party. As they came around a large hill they at once spotted a second sturdy wooden bridge, like the one crossing into the city. This bridge, longer then the one leading into the city Cor gauged, was about two hundred yards long and easily wide enough to allow the medium sized wagons to pass. However unlike the one leading into the city this bridge was guarded by 3 giants and a pair of the blue metal Golems. The giants armed with swords, large axes, and dressed in armor the same shade of blue as the golems, were very alert. Around them were numerous tepee stacked spears. The golems though not as large as the giants, were still an imposing sight their bodies all blue metal and jointed for easy movement. Armed with large spiked maces and shields, they stood immobile as if awaiting the command to attack. The party could see that both the far and near sides were bare and open, with no way to approach the bridge without being seen. Quickly retreating back behind the large hill they readied themselves for a fight and waited for any shouts of alarm. However the gods were smiling on them this day as no shouts or running boots on wood were heard. For the moment the party was yet undiscovered. Posted on 2015-11-25 at 18:20:49. Cor muttered a muted curse when he caught sight of the giants and golems guarding the bridge. It seemed there would be no sneaking onto the castle grounds. "Well lads and lasses, seems we have a wee conundrum. Shall we try ta sneak into the city, fight our way into the castle or try our luck flying to the island? Powerful as we are, I think it might be bad ta try ta attack a castle with only our small group. Of course if anyone else has an idea speak up." Posted on 2015-11-26 at 14:16:47. The party had had viewed the city and now chose to see if the risk of the castle might be less. But when they approached bridge needed to cross to reach the castle it was guarded by armored and well armed giants and golems. Ulthok read into this that who ever lived in the castle did not trust those that lived in the city so having a group of strangers show up would not go well. Knowing they must avoid a conflict with these creatures they quickly once again concealed themselves. Their options just became even more limited. So pulling a pen and parchment the mage duplicated what he could remember from the map they had seen. 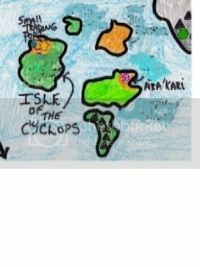 Having now seen the size of the city and a bit of landscape they might be able judge better the challenge of distance they faced to get to the Cyclops island. They may have to consider a more direct path that didn’t include sailing…perhaps flying? Posted on 2015-11-27 at 20:56:34.